ADVENTURE is...Blazing new trails...Out West! Your GOG Foothills Tour highlights Colorado Springs most well known landmarks. 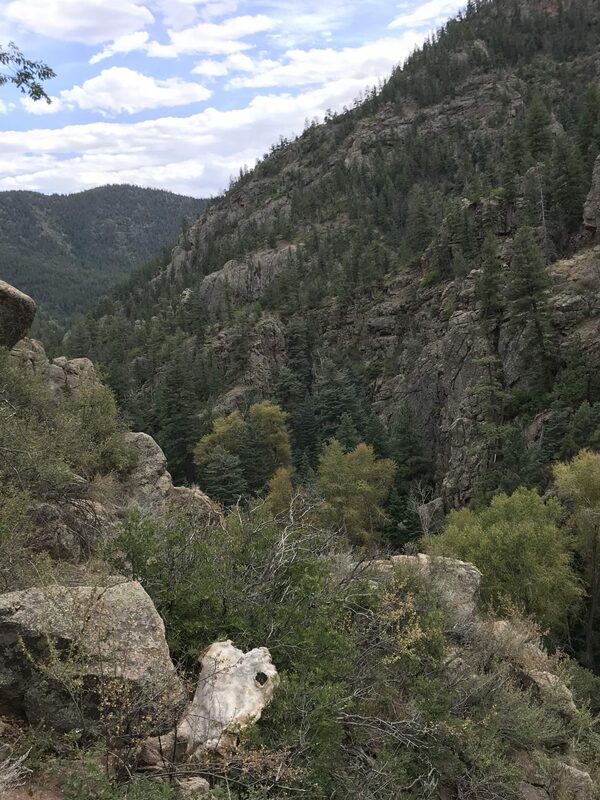 Garden of the Gods, Cheyenne Canyon and Manitou Springs. Colorado History, Railroad Tunnels and Amazing scenery will provide an adventure you’ll never forget. Our most popular Jeep tour, this historic sight-seeing adventure is a great way to enjoy the Pikes Peak region! Our entertaining and informative cowboy guides take you through time along the foothills of Pikes Peak, highlighting scenery and some of Colorado Springs’ most famous historical sights. 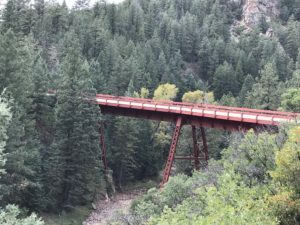 Attractions include North Cheyenne Canyon, Helen Hunt Falls, the Shortline Railroad and its 100-year-old tunnels, Old Colorado City, Manitou Springs, and the spectacular red rock park Garden of the Gods. In our open-air Jeeps, your photo opportunities are unobstructed! This tour is about 70% on paved roads and 30% on dirt and is offered year-round. Includes bottled water, sodas, light snacks, wool blankets, and the best cowboy Jeep guides in The West!! 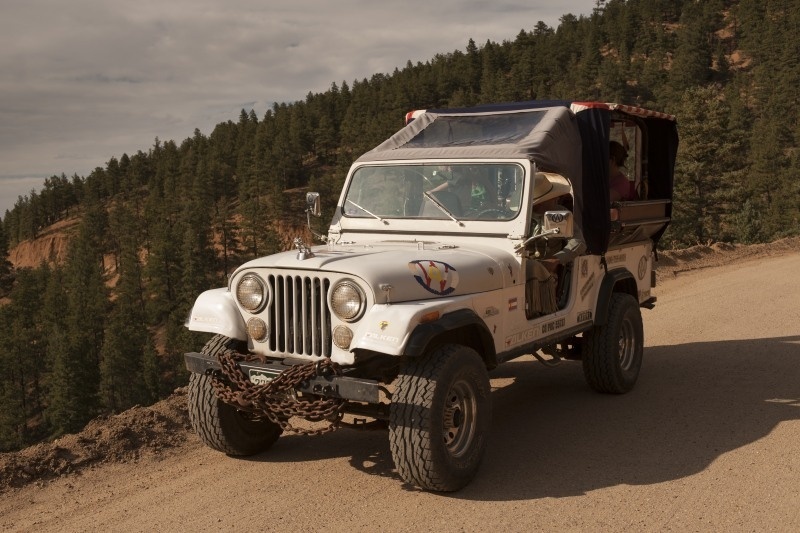 Take in the splendor of historic Old Stage Road from an open-air Jeep!! Our cowboy guide will take you on a scenic journey to the Old Stage Riding Stables for a one-hour mountain horseback ride!! You will feel like an early explorer, as your horse carries you through the rugged grandeur of the Pike National Forest. Relax and take in the stunning alpine overlooks and breathe in the fresh Rocky Mountain air. You may even view buffalo and elk!! 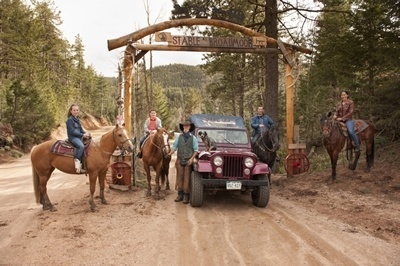 Following the horseback ride, our cowboy Jeep guide will enlighten you with tales of the Old West as we return to town. Includes bottled water, sodas, light snacks, wool blankets, and the best horseback guides and cowboy Jeep guides in The West!! We decided to add a little adventure to our lives and the Jeep and Horseback tour was perfect. Let AOW do the driving. Pike National Forest Off-Road Adventure. 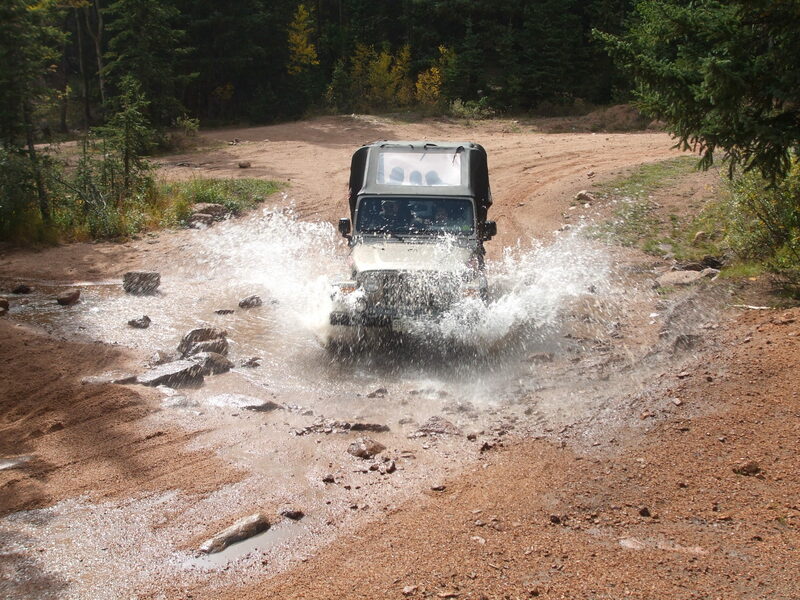 Our High Country Tour is the heart of Colorado Adventure. Since 1890 explorers have traversed Pikes Peak in search of Gold and a better life. 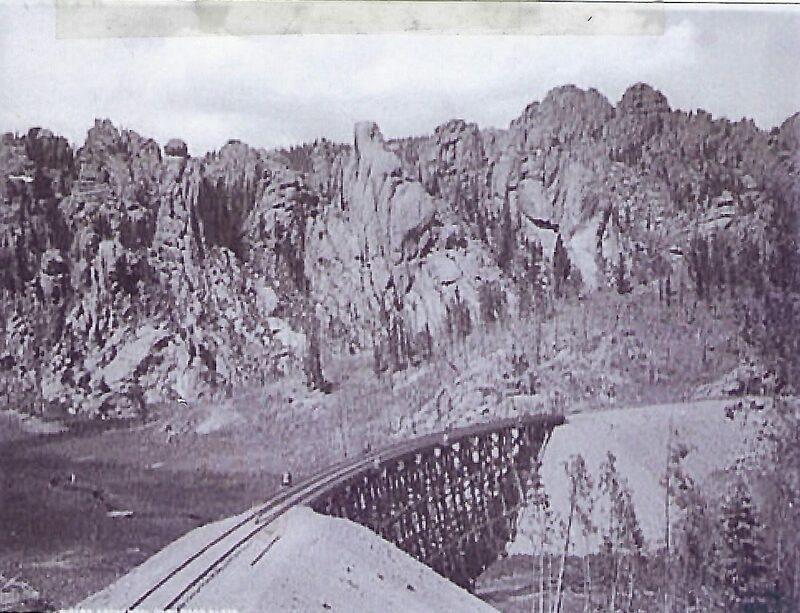 Your tour follows the Short Line Rail Road Bed that President Teddy Roosevelt once embarked upon proclaiming, “The scenery bankrupted the English language.” Our Forest Service Permits allow us to go off-road, cross streams, explore tunnels and townsites of the Old West. Plan 3-3.5 hours and dress appropriately for this awesome adventure into the Colorado High Country. This tour only runs on weekdays to give you the best possible experience. 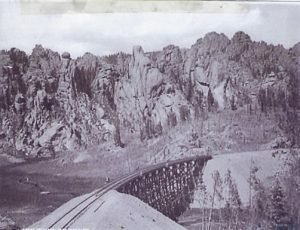 This is a Rail Road Buffs dream tour through history. Click on our our Pikes Peak Summit link for further information. Americas Mountain is AOW’s top tour! See all of America’s mountain on this adventure to 14110′! The tour is offered in the mornings to take advantage of the best views and weather Pikes Peak can offer. 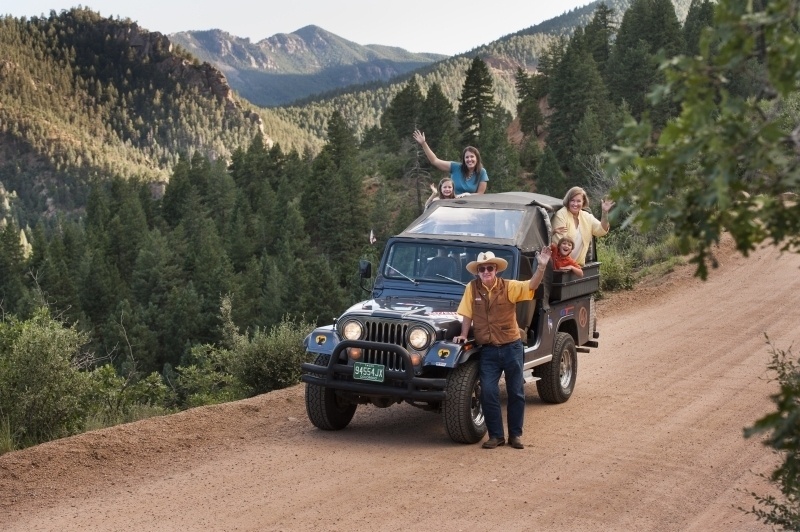 Your cowboy Jeep guide will make you feel right at ease on this Highway to the Clouds. The 19 mile drive reaches the summit where you will delight and soak in the extraordinary view that inspired Katharine Lee Bates to write “America The Beautiful”! After spending some quality time at the top, we’ll climb back into our open-air Jeep or Hummer and descend this famous mountain. 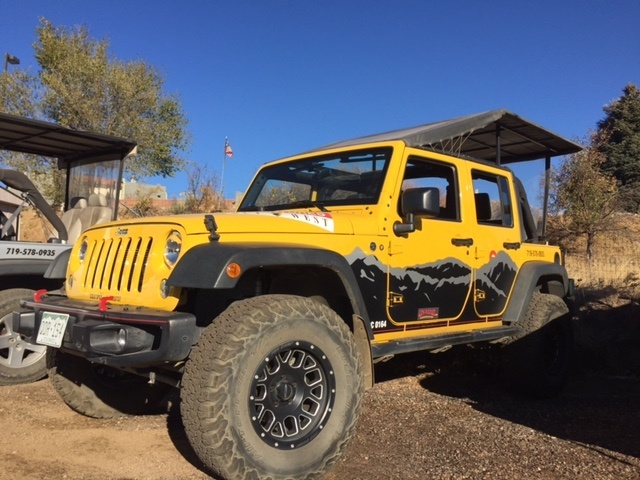 Nineteen miles of historic Rocky Mountain road brings you back to Manitou Springs and our AOW Jeep depot. Includes bottled water, light snacks, wool lap blankets, a souvenir tubie and use of our Columbia summit Parkas. Not to mention the best cowboy Jeep guides in The West!! 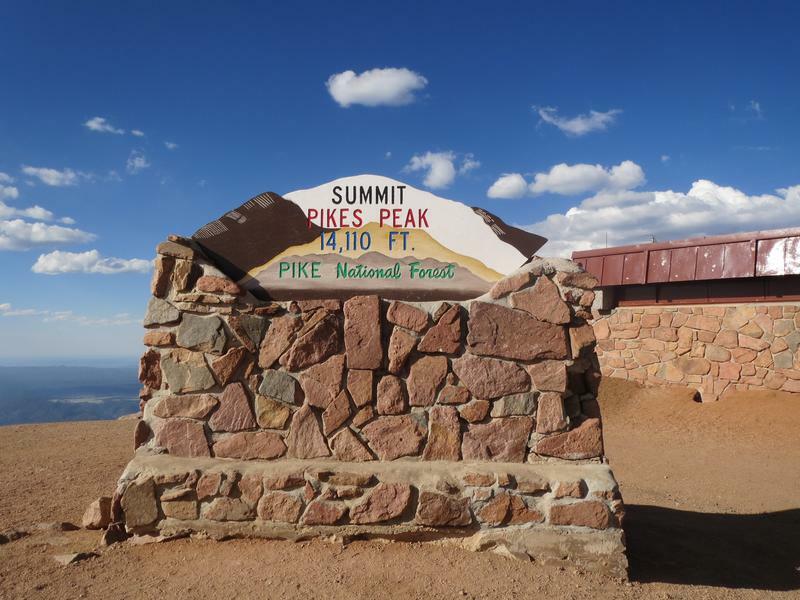 Please visit our Pikes Peak Summit link for additional information. 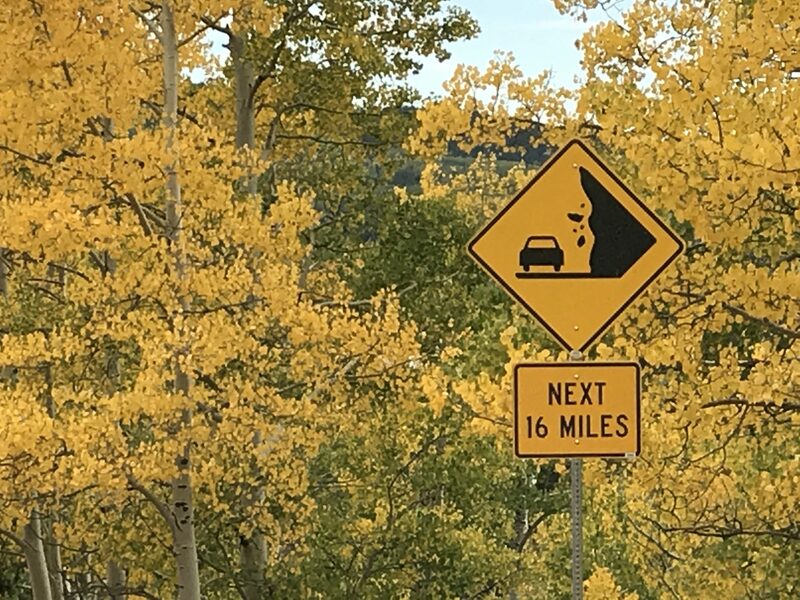 I had done Pikes Peak before but this tour was way better because I could watch the scenery instead of the road. Prepare for the an awsome day of adventure. 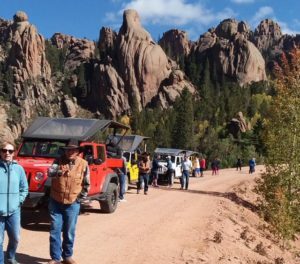 This all day tour includes a Jeep adventure over the south side of Pikes Peak on the Historic Gold Camp Rail Road route and a plunge down Phantom Canyon rd. “Scenery that bankrupts the English language” will great you along the way. The three hour Jeep tour stops along the way for awsome photos of old ghost towns and majestic rock formations. The mountain valleys give way to high desert as you arrive at Echo Canyon River Rafting. Your guides will greet you and serve your plated lunch on the patio with views of the Sangre DeCristo Mountain Range. After lunch its time to Raft on your choice of beginner or Advanced white water. The 3 hour rafting trip is as good as it gets on the famous Arkansa River. At the completion of the rafting trip your party will load up for the 1 hr drive back to Colorado Springs on beautiful Hwy 115. Class 2-3 Whitewater Big Horn Canyon $250.00- A Good family trip or for those who are a little more hesitant. This trip up the Arkansas is full of scenery and fun. 8-10 hours total tour time. 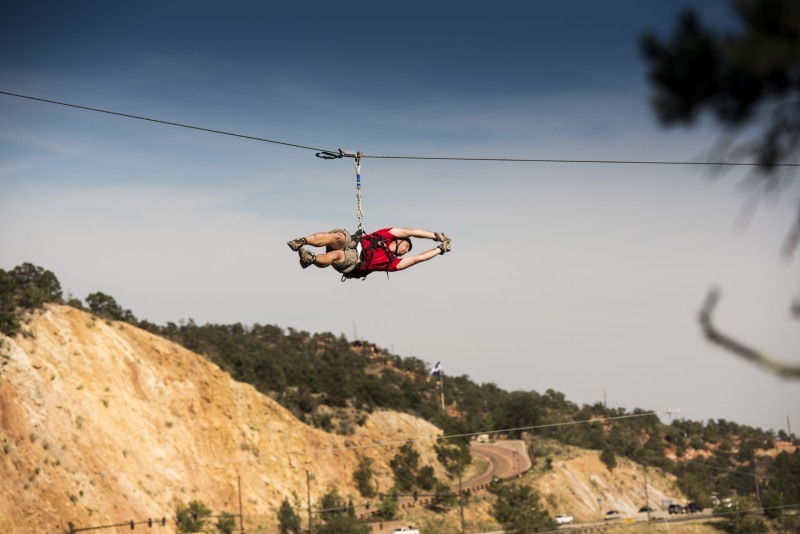 Depart Early from our AOW HQ on 21st st. in Colorado Springs, 7:00am. At the end of your rafting adventure you will have a chance to change into your warm snugglies that you brought along for the return trip to Colorado Springs. 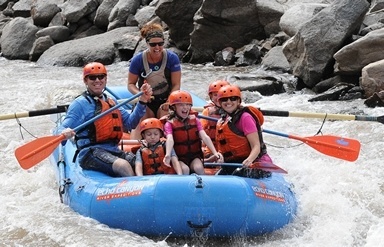 This all day adventure is the only rafting trip that departs Colorado Springs. Bring a day bag with all needed items. Warm Clothes for the Jeep Tour portion of the trip. Bathing suit, Towel and Sunscreen. Souvenir money and a camera. Please call our Head Quarters to book this tour. Advanced reservations recommended. R U Kidding me? Echo Canyon was great and the water was even better. What a blast! AOW offers cutomized adventures for you and your team. Team building, Scavenger Hunts, Unique Party Transfers AOW has your needs covered. Our fleet can carry up to 80 people depending on the time of day. AOW took care of all the arrangements and I got see all of Pikes Peak, Awesome! 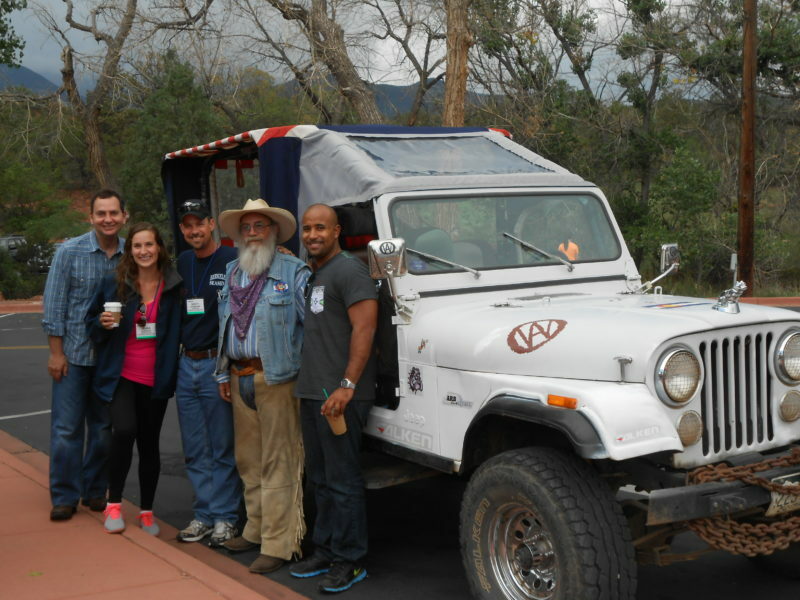 An AOW 4 x 4 Tour is a memory for a lifetime. Our Cowboy guides and well maintained vehicles will ensure a fantastic adventure for you. For 25 years AOW has been the premier Tour company in Colorado. We are here to help make your adventure the best possible. Call our office if you have any specific questions, custom tour needs or Group tour inquiries. We use a variety of Vehicle models for our tours including classic Jeep Scrambler, the modern 4 door Jeep Unlimited and a Hummer H2. Depending on the tour booked and guest loads we will choose the vehicle that best fits your needs. Tour vehicles are modified to enhance the guest experience and do not offer as much protection as a traditional vehicles from both the elements and other vehicles. 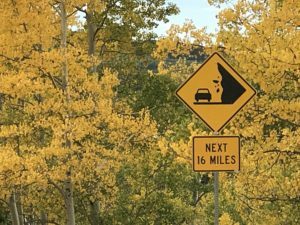 The trucks are commercial vehicles and are regulated by the State of Colorado. Seat belts and Car seats are not required but are recommended. Please bring your own car seat if you need it. All tours include snacks and water. We also carry wool blankets for your needs. Guest should dress in layers and wear sunscreen. This is wind in your hair fun and adventure. You might get wet! 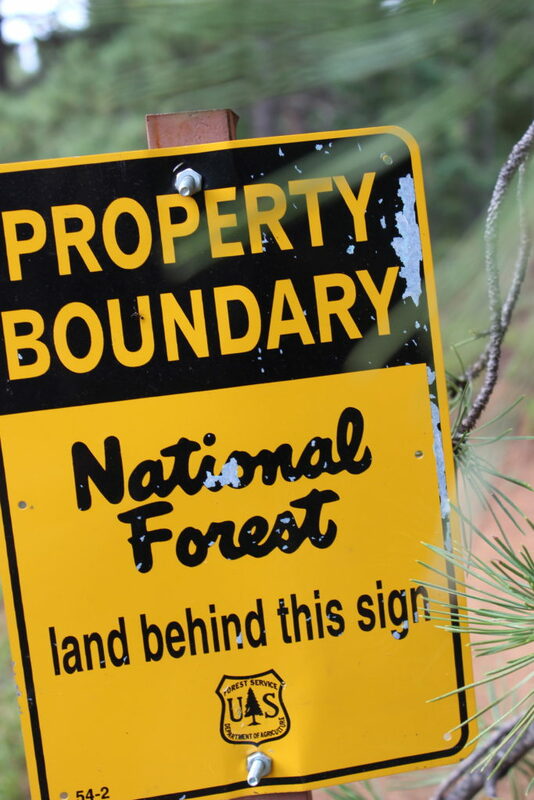 Adventures Out West is a Permit Holder of the Pike National Forest and is an Equal Opportunity Employer and Provider.